Such a great masculine card - I always struggle with these! I love the use of the wood panel on the circle and the spatters on the background. Thanks for sharing with us this week at CC&S! Great way to combine the two challenges. Just love the little bird sitting in the tree. Thanks for joining us on this week's CC&S challenge. Thanks, Fiona! It was a great sketch with which to work. Wonderful card. Love the wood grain behind the tree. Thanks for playing along with us at CC&S! This is just super! I do like the woodgrain panel behind the tree. Thanks so much for playing along with our Wood stash challenge at The Male Room. Deborah, DT. Thanks, Deborah! It was a fun challenge. 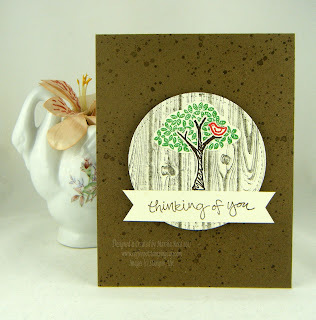 I've had the woodgrain stamped for a while and just sitting in my stash.